PORTLAND, Ore. (KOIN) -- A Milwaukie police officer was shot in the leg after exchanging gunfire with a man suspected in an earlier gun incident late Saturday night. The incident unfolded around 11:20 p.m., Milwaukie police said. 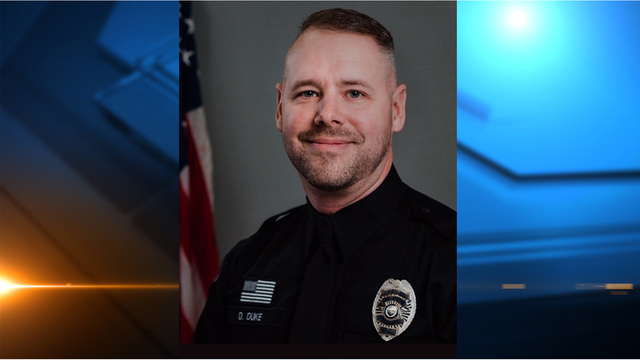 Officer Daniel Duke tried to contact the man near SE Monroe and 42nd. The suspect, 30-year-old Douglas Joseph Teter, kept moving and Duke used a Taser on him near SE 42nd between Jackson and Harrison. The Taser wasn't effective, officials said, and the gunfire erupted then between them. When Duke was shot, Teter ran and hid under a truck and camper on SE Llewellyn Street, where other officers found him. Teter was Tased again before being taken into custody, police said. Duke was taken to the hospital with multiple gunshots to his leg. He was released Sunday and is recovering at home with his family. The Milwaukie Police Department said Duke is very sore and needs crutches but is in good spirits and should make a full recovery. Duke has been with the department for 11 months working the graveyard shift. He was an officer in Rathdrum, Idaho for 7 years before that. Teter faces charges of assault and attempted aggravated murder and had 6 outstanding warrants for criminal mischief, interfering with a peace officer, DUII and disorderly conduct II. The lead agency in the investigation is now the Clackamas County Major Crimes Team.